Background: Data on early childhood caries (ECC) prevalence are essential for implementation of preventive programs. Currently, Serbia lacks both representative data and active prevention program regarding ECC. Recently, Serbian Ministry of Health approved project that will determine prevalence of ECC in a representative sample of Serbian children. This pilot study aimed to test feasibility to implement large scale nationally representative survey on ECC by first analyzing small scale data from the capital city. Methods: We created the sample for cross sectional survey using the Basic Methods for Oral Health Surveys by World Health Organization - stratified cluster technique. The study included 100 three-year-olds from 2 suburban and 2 urban sites in the capital city. The researchers examined children using dental mirror after approvals of local authorities and parents. Results: Mean age of children was 3.5±0.3 years. Both genders were similarly distributed in the sample. 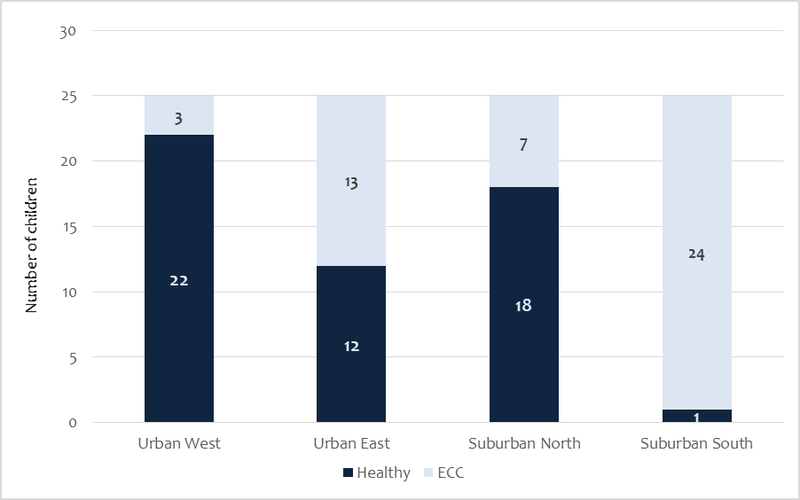 ECC was the most prevalent in 2nd suburban location (24/25 children) (Figure 1). Almost half of the examined children (47.0%) had more than one primary teeth surface with ECC, and 56.5% of ECC teeth were untreated (Table 1). Creating the list of capital city health care centers and randomization procedure took two weeks. Providing information about survey protocol to local authorities and signing the collaboration agreements took three months. Training course, calibration and all examinations were done within three months without encountering significant difficulties in study course. Conclusions: Absence of organized, community based oral health preventive programs leads to increasing prevalence of ECC, especially untreated. Our pilot study provided encouraging data that this survey protocol can be applied on a large scale sample. Accurate epidemiological data on ECC prevalence will support planning and implementation of well-structured and organized preventive interventions in Serbia - planned for next stages of the project.